These cream whippers are perfect for home use. This mini size 1/4L whipper will make up to 0.75L of fresh whipped cream or cold espumas in an instant! 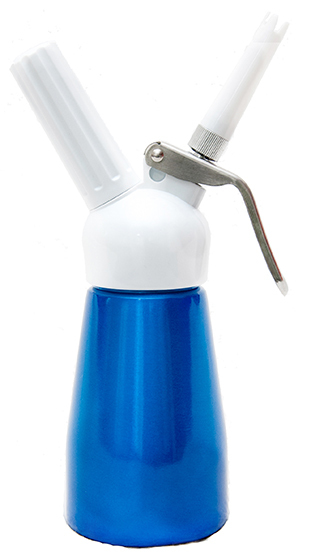 Uses 8g nitrous oxide (N2O) cream charger gas cartridges to whip and propel the cream. Cream charger cartridges are cheap and easy to use. Nitrous Oxide also acts as a natural anti-biotic so the cream stays fresh in the whipper for up to 10 days if kept in a fridge. Only suitable for making whipped cream or cold espumas - please purchase one of our commercial grade Stainless Steel whippers for making hot Espumas or hot sauces. Do not use with hot ingredients. Not dishwasher-proof please hand-wash only. Plastic head and high quality stainless steel moving parts. 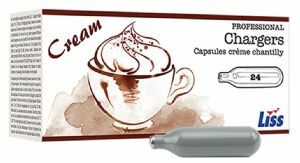 Uses cheap and easy to use 8g Nitrous Oxide (N2O) Cream Charger gas cartridges. Silicon head gasket with excellent resistance to high and low temperatures. Comes complete with charger holder, 2 different dispensing nozzles and cleaning brush. For use with standard 8g Nitrous Oxide (N2O) cream chargers only. Please read our Terms & Conditions before purchase. Misuse: We will refuse you service if we suspect you to be abusing this product.